Our chess sets are not to be stowed away after playing. The elaborate craftsmanship, the premium materials, the historic designs and the attention to detail create a decorative object of high value. 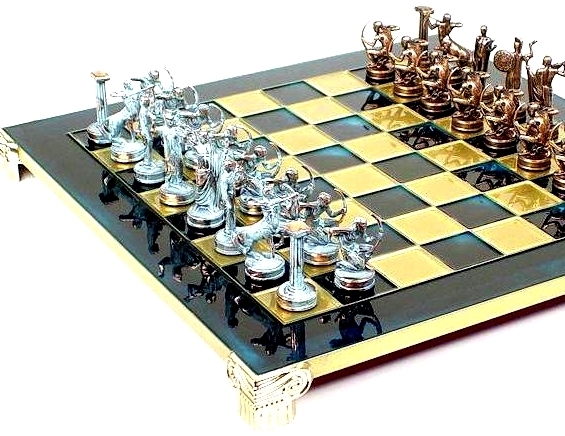 Our chessmen are made on a basis of an original zinc alloy, they are then gold or silver plated and finally varnished by hand. The chess boards are made of bronze and painted by hand. All the pieces are unbreakable and have a life time guarantee. - a choice between a brown, blue, red or green chess board. The chess set comes in a beautiful wood box. There are more designs and sizes of chessmen and boards available. Please contact us for more information. (board) 36 x 36 cm - 14 x 14 in.